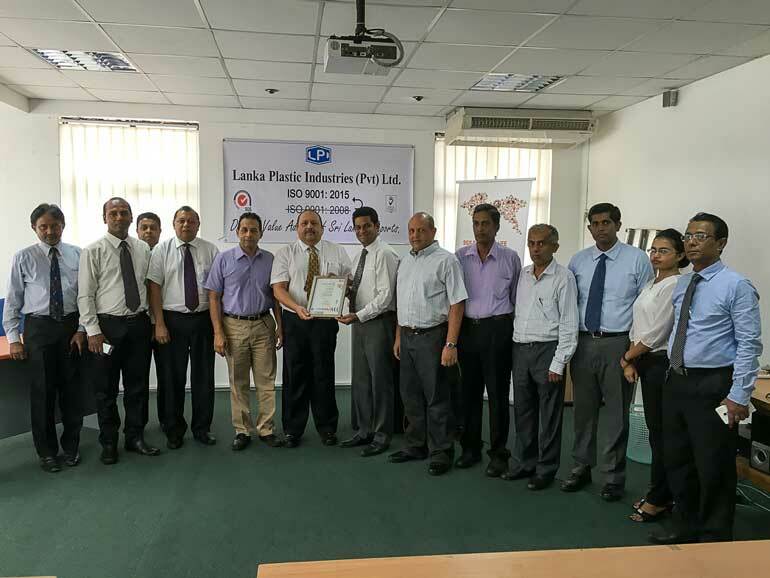 Lanka Plastic Industries Ltd., an advanced technology BOI approved company engaged in the manufacture of printed flexible packaging materials especially for value added exports from Sri Lanka was awarded ISO 9001-2015 certification at a ceremony held at SGS Lanka Ltd. early this week. The company employs the latest cutting edge technologies from Germany, Japan, Italy, USA etc to manufacture high quality Flexo printed laminates to international food safety and aesthetic standards in a range of innovative bag and pouch styles. The company serves both food and non food sectors which include value added tea pouches, tea bag envelopes, rubber gloves, choir fibre products, garments, activated carbon and a range of other FMCG sector items. Lanka Plastics provides a vital service in the exports value and supply chains by making available such critical high quality printed packaging materials to Sri Lankan exporters with very short lead times thereby supporting their ‘Just In Time’ and Lean Manufacturing systems, while also providing a powerful branding tool thereby empowering exporters to win orders in fiercely competitive international markets. A past Gold Award winner in the Dupont Cyrel Grand Prix Asia Flexographic Printing Competition, Lanka Plastics was the first in Asia to install the world’s most advanced ‘SMART GPS’ Flexographic Printing System that enables efficient high definition printing on a variety of flexible substrates with low waste and short run capability. The recent installation of an advanced Japanese pouch making technology is another pioneering investment that has enabled Lanka Plastics to offer advanced box style pouches with re-sealable and tamper evident ziplock closures, highly sought after by leading value added tea exporters. SGS Lanka Ltd. Business Manager Chamika Wimalasiri presenting the award, stated that Lanka Plastic Industries Ltd. is the first company in Sri Lanka to be certified by SGS under this new ISO 9001-2015 Quality Standard. Also, Lanka Plastics is the first flexible packaging company in Sri Lanka to obtain this certification. The new ISO standard emphasises customer focus, leadership, engagement of people, a process-oriented approach with continuous improvement and strong well managed relationships. In the older ISO standard customers were often named as being the only interested party. This concept has been extended in ISO 9001-2015 by engaging suppliers, personnel, shareholders, legislative bodies, society etc. as interested parties. This after all is beneficial to all concerned.